Jennifer Sumner administers the oath of office to Lamaz Robinson, Johnston’s new Chief of Police. A place to sit was at a premium last Monday night in the Johnston City Council Chambers. Well-wishers filled the room to witness the swearing in ceremony and to offer support for the new Johnston Police Chief. 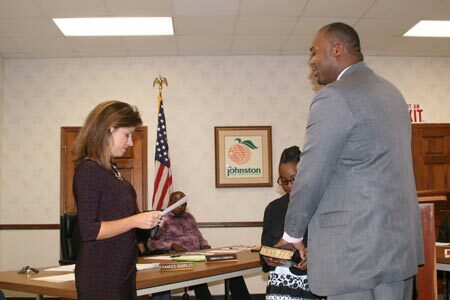 Town Attorney Jennifer Sumner stepped forward and administered the oath of office to Lamaz Robinson. Being duly sworn in the new Chief of Police addressed the admiring crowd thanking all that made it possible for him to achieve his goal. A standing ovation followed Chief Robinson’s comments. Council then approved second reading of Ordinance 2014-04 that increases the membership of the Zoning Board from three to five. They also approved use of the municipal parking lot for the annual Christmas Tree lighting and dealt with a need for a Christmas Tree to light. Mayor Culbreath proposed that the town procure a new tree to be paid for with hospitality tax revenue and matching funds provided by the development board. Councilman Burton led the charge stating, “We are due for a tree and I think we should purchase one now utilizing the hospitality tax funds that can only be spent for items of this nature.” Council then approved, unanimously, the purchase of the tree. Councilwoman Miller then reminded her counterparts that consideration should be given to acquiring ornaments to adorn the new tree. Following a brief discussion Council voted to expend the annual Christmas decorations budget for large ornaments for the new tree. Council then took up Ordinance 2014-15 an ordinance to provide penalties for persons who allow their dogs to go to the bathroom on sidewalks and fail to remove the feces. The Ordinance received first reading approval. Mayor Culbreath then presented a plan for upgrading of the Town Hall telephone system. Following a detailed description of the technical aspects of the upgrade, Council voted to have the system installed. The Mayor then announced that Johnston will host a job fair on November 13th at the Johnston Learning Center. He also rolled out his plans for “The Johnston Clean Team” a concept to provide assistance for the elderly in keeping their property up utilizing volunteers. The Mayor then announced an initiative that is underway to bring a YMCA to Johnston. He has met with the YMCA organization and they have indicated an interest in coming to the town and being housed at the Armory property. Mayor Culbreath has also reached out to Edgefield County and Edgefield Municipality to see if they have interest in joining in the effort to bring YMCA to Johnston. The next step in making the location of a YMCA in Johnston happen is conduct of a community survey in regard to potential support and usage of activities provided by the YMCA organization. Mayor and Council request that citizens complete and return subject surveys that will be distributed on the 20th of October via the schools and Town Hall.